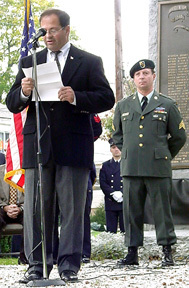 On Sunday, October 27, 2002 at 2:00 p.m, a Vietnam War Memorial Dedication to the Memory of Robert P. Gandil, Thomas J. Holden and Michael J. Macarell was held at the Veterans Memorial Park. 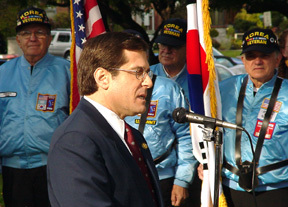 Daniel Vecchio served as Master of Ceremonies. 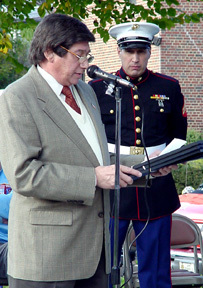 The Pledge of Allegiance was lead by Lou Mujica and the National Anthem was sung by Ray Alameda. 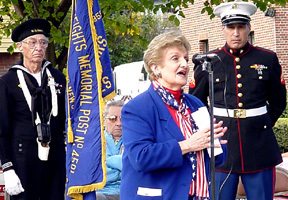 Dignitaries and speakers included William J. Torre (Mayor), Steve Rothman (US House of Representatives), Joseph Coniglio (NJ Senate) and Rose M. Heck (NJ Assembly). Oral presentations were made by Councilman Justin A. DiPisa, Councilman John Wassberg and Robert Searle -- while Edward Mahonchak, Salvatore Altomare and Michael Cahill presented plaques to the family representatives. Sergeant of the Guard Anthony Mayo unveiled the bronze plaque on the Memorial Stone. Taps were played by bugler Douglas Grunn (Bugles Across America) as a final salute to the honorees. Danial Vecchio then made a closing address. Bagpiper State Trooper Joseph Brennan (NJSP Blue & Gold) provided opening and closing music. Participating organizations included: VFW Memorial Post 4591, American Legion Post 106, Korean War Veterans Association (Taijon Chapter 170), 196 Light Infantry Brigade Association, Nam Knights, Quantico Athletes Reunion Association, Hasbrouck Heights Police Department, Hasbrouck Heights Fire Department, NJ State Police, Bergen County Sheriff's Department and DPW & Supt. Robert Heck. 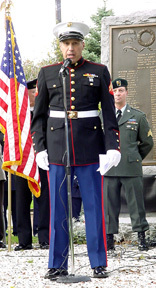 The Honor Guard for the service included: VFW, Am. 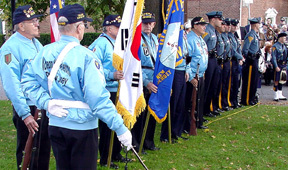 Legion, Vietnam Vets Honor Guard, Nam Knights, HH Fire Department, Korean War Vets and NJ State Police. and the National Anthem was sung by Ray Alameda.